Elle ne s'obtient donc pas sur le boss Grognus et n'est pas lié quand ramassée et peut donc se vendre à l'hotel des ventes ! Monture se trouvant dans Cadeau sauvage pendant le voile de l'hiver, vendu par Izzy Sacréplouf. Elle n'est pas liée, donc vendable ou achetable à l'HV ! New to the 2015 Winter Veil holiday event. Rare drop from Cadeau sauvage. Grumpus, a reference to the Krampus from Germanic folklore? This is a Yeti mount similar to Yéti de guerre du prétendant but with a different skin color. Here's to years grinding another holiday mount I will never get! Oh boy. Time to level up some more alts. Christmas present or from the Daily Grinch quest. This seems to be the first Yeti mount introduced other than the Challenger's War Yeti. I'm conflicted about this. I like the recolor over the challenge mode mount but at the same time it makes the challenge mode mount less cool because it's not super unique anymore. I mean with the artifact weapons coming in Legion it already makes the CM weapons less likely to be used. Oh well though, neat mount at least. I NEED THIS MOUNT. It is both black and a yeti. Yes. Please. Winter can't come sooner..
Looks like its drop rate's going to make some players grumpy. The eyes on this thing are rather unsettling.... Maybe some decorative glasses to cover them up blizzard? Just curious , is it said that its a low % drop because cant see that anywhere , or maybe can be sold by vendor for a certain holiday currency/maybe an achievement reward? This had better be from presents or Father Winter or something. If it's actually a drop from the Grumpus, imagine how hard it is to kill him once per year for the quest (on my PvP server) and multiply that by a thousand. One yeti to ook some hozen dooker. Don't you ookin agree with me wikkets ? Oh wow, I think this may actually be a reference to the movie One Week as the main character's father always told him the story of Grumps. The climax of the movie is referenced in the flavor text here. This isn't BoP, much like the valentine's strider. Perhaps a new vendor item, and not a crazy low drop? hurr durr im blizzlerd, lets take a rare mount (CM) and reskin the &*! @ out of it -,-. Hoping it doesn't get changed to BoP later in. Hey I'm Grumpus! I'm not so Grumpus! And we're the Game Grumpus! drops off of Grumpus in Frostfire Ridge. With Winter's Veil dropping on Wednesday, the Minion of Grumpus mount will come with it. It appears to be from a garrison daily quest Grumpus, which is a mini boss in frostfire ridge. It is speculated to be a low drop chance from killing the mini boss. It also seems to not be a BoP, meaning it will probably be seen in trade of the Auction House. I like this, I'm tired of the 0.5% holiday drop rate mounts. Small chance drop from Cadeau sauvage, which can be purchased from the garrison festival vendor after completing the four dailies with Fournitures joviales. The mount is tradable, and if you do not loot the item inside you are able to refund and purchase a new one until the mount drops, took me about 70 tries. This lovely mount has a chance to drop from Cadeau sauvage which is sold by Izzy Sacréplouf in your Garrison. Cadeau sauvage can be obtained as early as your first set of Winter Veil dailies in your Garrison, with the gift costing 5x Fournitures joviales. its in game now . its can pop from stolen treet.for me old rotten helper pop. so i sugest farm a week. at 20-30m if some people had and others listed ah cant super rare. so no way rare like love rocket. ididnt see love rockets around entire year compare now seen 20-30m newly start even grumpy. i wasnt aware mount i was doing this year for pets. So there is a small chance of obtaining this mount from Cadeau sauvage which can be bought from Izzy Sacréplouf for 5xFournitures joviales. Do not use exploit. I just banned 5 mins ago for 3 hours. The bag that drops this mount is no longer refundable, it was hotfixed. The trick with the Cadeau sauvage has been already hotfixed. Do NOT attempt this anymore. The vendor won't refund it. Oh dear Elune, please don't let this be as elusive as the Big Love Rocket. Rumor has it that the refund "bug" of the savage gift has been revoked, makeing it non-refundable which means you can no longer open it, take a peak and then sell it again untill you loot the mount. If this is true I can only say about good, it's not ment to be easy to get, it's a rare holiday mount and makeing it accesible for everyone smart enough to exploit it is a dumb idea. Got mine from first gift! Can anyone confirm that this is a rare drop off grumpus (in addition to the savage gift?) If it is, has anyone gotten it from grumpus on the 2nd+ kill of the day (can you loot him more than 1x per day?). For anyone stuck on the "What Horrible Presents" quest, I recommend getting the other four Merry Supplies (which are BoA) you're able to get on as many characters as possible. Mail them all to one character and buy the Savage Gifts. I may just be extremely lucky, but I received 2 Minions of Grumpus from opening 8 Savage Gifts. If you end up with more than one or don't care to keep one for yourself, there's gold to be made on the AH since these mounts are not BoP. Does anyone know the % rate from the Savage gift? I never get anything in my life and I just got it from the first girt i bought. So either it's high % rate or i am very lucky! For all those having trouble with the gift quest I would recommend doing it in a group of 5, much easier. Also.. the mount only drops from the savage gift that you buy from the vendor with 5 holiday supplies, so you can only buy one per day per character. I received my mount on my 3rd character, so I dont know if I just got lucky or what:) Will continue to do them everyday and hope for a second to make some gold. Happy farming! I can confirm this DOES drop from the Savage Gift. I got it on my very first one and sold it immediately for 250k. I took a screenshot, but it didn't get saved. IT IS SELLABLE Thank god! No more useless farm for 2 weeks on this! so 0-5 tries, seems the drop rate is not much...or I'm cursed as usual lol. Granted its only the first day, so on I will carry! I'm seeing this as the next "headless horseman mount" sadly lol. Best of luck! Just got one on third alt i see people trying to buy them. My friend and I received this on our first try - wondering if it's bugged? This Mount does NOT count for Mount Parade. Weird. Yesterday, It didn't, today it did. Got this on my 3rd alt today. Does anyone think they will re-release this mount next Christmas event or will this be a Warlords only thing because of the unique Yeti skin and Savage Box name in particular? If they don't release the mount again I'm holding onto it to sell later in Legion. P.S I spent over 100 hours grinding Infinite Timewaster mount - except my luck was with the Christmas event the whole time zzzzzz. Christmas came early this year for me! I happen to get the infinite timereaver on the Dec 14th ( just this Monday ) and then Minion of Grumpus POPPED right outta my 3rd present (multi alts) ! Two amazing mounts I had been waiting all year for a chance to farm them! I couldn't be more grateful and I really wish everyone the best of luck! Merry Christmas! Got mine today on my second toon to do the dailies! Must not be THAT rare though. There are so many up on the auction house that the prices are plummeting from competition. was 500k this morning, down to 150k atm. Tomorrow will prolly be even cheaper. So if it doesn't drop for you you can just buy it cheap eventually :) gl all! 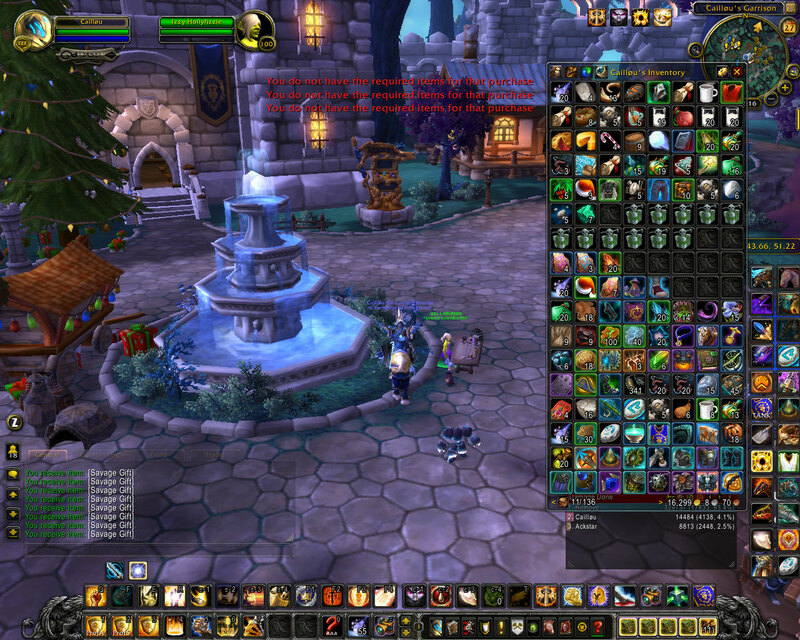 And what about the people who refunded over and over the bag and got the mount doing this method? Now they are mounted on it and we have only 1 chance per day to get the mount or have to go to the AH. This grind makes me very Grumpy. *Edit* Remember Guys, Merry Supplies Fournitures joviales are Bind on ACCOUNT, so you can send the ones you get with your geared characters to an alter who needs: resources or oil. So, good luck to everyone! At least for Horde these are much much easier than flying out to Hillsbrad each day! So theres 1 % chance? Feeling lucky today I guess. 3 Mounts out of 14 gifts. edit: dayum people downvoting me, are you guys that jealous? The price in the Latin American server Ragnaros has dropped to 60k, at this rate I think it will better for me to buy it. Got it in my first box, Merry Christmas to me! Does anyone know if this can be mailed to the opposing faction? I don't think it can be but wanted to check if anyone has tried to and could confirm a yes or no. I've already learned it for myself but getting one for my guild's Christmas gift give-a-way would be awesome! I could really use the medallions on the opposite faction however, which I know can not be mailed across faction. Edit: Not sure why this question was down-voted. I clearly stated I was checking if someone else had already tried it and it still feels like a valid question that someone else may be interested in finding the answer as well. Also, I would have to wait and possibly never have the opportunity to try since I was REALLY excited to see the mount and learned it instantly. I can't un-learn it to check for myself, unfortunately. I do appreciate the response, magette. I can confirm that you get the mount Minion of Grumpus from a Savage Gift. It was in the third gift I purchased. Either the % drop on this is much better than some other holiday items, or the RNG just loved me. Dropped on 20th box i opened. Note, oddly enough I opened about 15 or so one one toon. and 5 boxes one each on some others. It was one of the toons that ONLY opened one box that got it. Not that i think it matters. Just thought i would throw that info out there. Just heard about this mount. I did the quests for it in your garrison, and then came back to buy my first Savage Gift. Got the mount luckily the first try. I'm assuming its a pretty standard drop. Good luck people. Haven't gotten the Headless Horseman mount, at all, since TBC thus far... and I got this mount instead on my very first Savage Gift. First day of winter veil, first savage gift opened and there he was. About time I had some luck with a mount drop. It's worth noting that this mount isn't bind on pickup, so once you get one for yourself, it might be worth the time to farm a few more to sell or give to friends at a later date. *A terminally grumpy person, often genetic. Can be medicated for various states of grumpitity. *Grumpus can be seen growling at strangers for hours. *often observed as A Slumpus (A sleepy Grumpus); don't disturb. OK, anyone got this mount with the prismatic socket yet? Someone was selling it and liked it to me, don't see how it works though, if you socket a gem in there for, lets say, crit bonus, then you dismount if you get in combat anyway? Anyone got it or tried it yet? Similar to the Challenge Mode Yeti, now we can take one in the same Genere with this "easy" way! I must have gotten lucky. Got one in only my second try. 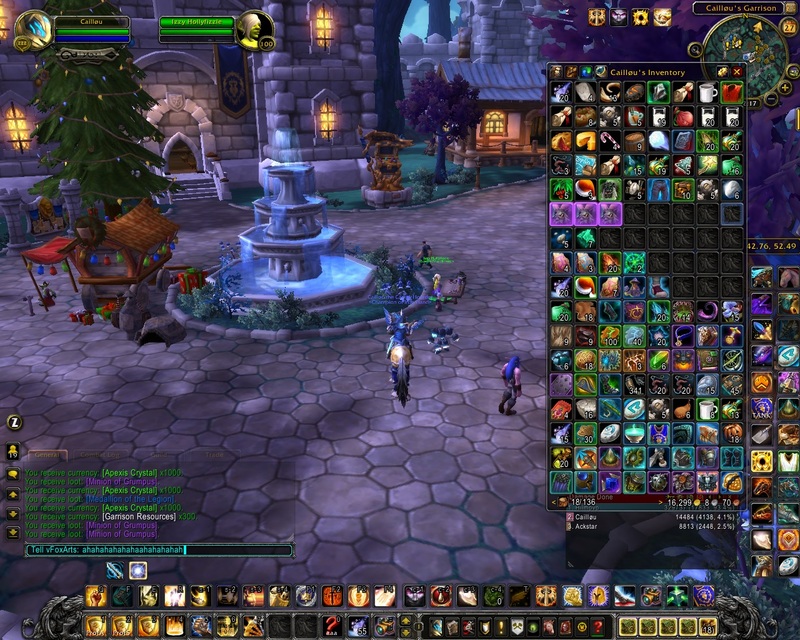 Having multiple toons I've been able to open 30 boxes so far, still no mount. RNG is what it is, but I just wanted to let people know it's not something that is going to always be an easy completion. I now know why he is called Grumpus, When you open your box and don't get him, it tends to make you very grumpy. Lots of people are complaining that they are not getting the Minion of Grumpus from their daily quest in Iron Forge. I have had to explain to lots of people that the Savage Gift box is where that mount comes from and has to be bought at a Garrison Holiday vender named Izzy Hollyfizzle<Events Coordinator>. Just got my third from around 20 it must not have a low drop or i've been extremely lucky. I have just got my third Serviteur de Grognus from no more than 25 Cadeau sauvage's,it must not be a really low drop or if it is i've been extremely lucky. Took me about 58 attempts. This mount currently is sitting at a 1% drop rate. For those of you who are not good at math, that means, on average, 1 should show up out of 100 boxes you open. Feast of Winter Veil will go on for 17 days. So, here are the statistical chances you'll have to get this mount, based on number of alts you are using to try and get it. 1 alt - 17% chance of getting the mount. 2 alts - 34% chance of getting the mount. 6+ alts - should statistically guarantee the mount, unless the RNG gods are frowning upon you. Now, this is pure statistics, without taking into account RNG unequal possibilities, etc. Each alt must do the quests and open a box each and every day. All things considered, lump all players together, and the above chances are correct. For those on PVP servers where the entire area is overtaken by the other faction dominating any of you attempting to finish the quests, make sure you are using the group finder, there are lots of groups every day looking for people to finish the quests with. Dropped the first time I purchased the savage package. I came here to see how rare it was. This means I'll probably not be seeing the other mounts I've been farming in instances this last few months since returning to wow. Might add that this is mount is shorter than the coalfist gronnling mount. That was a bit of a disappointment. Since these grumpus minions are all grey they aren't really anything that special to look at either. This is beyond a joke,i've just got my 4th Serviteur de Grognus 2 of them i got from 5 characters in one day,is anyone else getting this luck? Notice the difference between at least and exactly as well, as you can see on the 1000 attempts, the chance of getting one mount is low... why? Well, that's since there's about 10% chance of getting 9, 10 or 11 etc. mounts, which sum up. However, you can never be 100% sure to get at least one (the one you need..) mount. Great timing, WOW Christmas present for me! Do yourself a favor and buy this mount now instead of wating to get it, it won't be obtainable for a year which will mean this mount will again be worth 100-400k (that will depend on quantity and your server) where as currently it seems to hover around 40k on many servers... so even if you buy it and don't end up using it, you will still be able to sell it at a profit. Im already seeing a lot less mounts on my high pop realm that actually stay on the AH as more and more people get impatient and there is also a upward trend in price now. It's already questionable enough that it's as cheap as it is. Do yourself a favor and just buy it now, if you still get it in a few days wonderful... this mount will go for upwards of 100k after this event is over again (Where as now it's somewhere around 30-40k on many servers)... it will be a year before you can obtain it again after all, don't be that idiot putting it for 25k into the AH, it's worth more. The amount of Bras gelés de héros i looted thinking it was this mount is too damn high! Just got two in a row, one on my main and on one of my alts the first day I opened the boxes. What luck! I love this mount. I just looted my 2nd one in 3 days on the same character, so it is possible to get it twice. Currently, there is no official word on whether or not this mount will be obtainable next year. So get yours while you can, if you can. Not really as much into WOW as I used to be, thought I would try the christmas dailies just once, tried them bought a savage box... got the mount first try. Not bad. Another mount that is too difficult to get, and people LOVE making a fortune out of it. Lucky I got it as a Christmas pressie from my family, otherwise I'd have to wait until next year! I kinda wish they just made these mounts bought from a currency you could collect. Currently at 143 dailies (11 characters each running them every day except the first, glorious, able to actually get the mount day which I missed) and I'm starting to think I'll never get it. I guess there's still time. Anyone willing to lend some happy thoughts would be greatly appreciated. I've was so lucky that I got one yesterday. Did the daylies today also, guess what? I got another one! I am so happy! Is it worth it to keep them and sell them in the summer? Would they be more worth by the summer? If you have not already, I recommend saving one or two of these mounts for quite some time. As Legion will be released next year, it is most likely that this mount will be no longer available to receive from the Christmas event as this mount is solely related to a Draenor legend. Anybody have a rough idea of what prices will be like for this on AH after the event? After doing the dailies every single day on 2 characters, I didn't get a single one, and so will buy one on the AH. At the moment, the lowest price is 50k. I assume the price is likely to skyrocket after the event ends. Should I just grab one now or wait to see what the price changes to? Anyone had one drop after the event has finished? - I have loads of the currency unused and planned to buy the gift boxes with them now (3/1/16). If anyone has noticed a noticeable change in the contents table I'd appreciate the feedback. I bought one earlier which contained the xp elixir so I'm hoping its still the same possible contents as during the festival. When the event started it had about a 1% drop rate, now the event has ended and it has a 3% drop rate. I did the dailies on 4 toons for most of the days, and got the mount twice. Saw my buddies never get it, so I gifted one of them the mount. Shares his animation set with Gronnlin poing-de-charbon, however it looks a little bit smaller. I think this is unobtainable atm. Don't see why Blizzard would put this in again @ the next X-mass. Can anyone confirm that this is still infact dropping from the gifts this year? Some info to people who didn't farm for this mount last year. 1) You need your own level 3 garrison in order to get the 4 quests that reward the daily 5 Merry Supplies. Use these 5 Merry Supplies to buy a Savage Gift and cross your fingers. Good luck to all and remember if you don't get the mount, the AH will likely be littered with them. Just give it a couple weeks and I'm sure the undercutters will have the mount below 10k gold like how Garn Nighthowl is. There was a bug in Cadeau sauvage at the start for 2015, people were able to get way more of these then they should have. Initially, prices were skewed due to the bug in Cadeau sauvage. Now, after one week of farming on US Realms... there are between 700 and 900 available for an average of 65k to 75k. This equates to approximately 1,200 mounts being available to purchase after Winter Veil 2016 ends. Way less than what sold over the previous year. So, expect prices to go up. If you don't get one to drop this year, you might have to fork over gold by the last day of the festival. They are just going to hold their value, or get more expensive the longer you wait. I know 24% of accounts have it already... but for those that don't... supply is only going to get tighter. Unfortunately this pet is just too tall. There's one particular bridge in Storheim where I have to dismount, every time. Really, there needs to be a height warning before bridges. As you look to your left you can see one of Trumpus many henchmen err I mean Minions and as you look to your right you can see the natural mountain side acting as a giant stone wall. As of possibly 7.25 they seem to have shrunk the size of this mount, but doing so also shrinks the size of my male night elf down to a dwarf height. This dropped for me today from that gift box. This just dropped out of my savage gift first time, I'm here checking the rarity. Beautiful detail on this. Took me three days of grinding on 10 characters. First day - nothing. Second day - nothing again. Third day - on my third character, it finally dropped. 25 attemps and i got it today, thanks this nice christmas gift blizzard! 0-for-98 Got it on try #138, I've been running it on 9 toons. Not sure that 3% drop rate is accurate or if it was inflated by the bug/exploit during the first year of the Grumpus. 52 savage gifts and didn't get it. There is always next year. Opened 52 Savage Gifts during the 2017 event w/ no luck. Opened 20 during the 2018 event and Minion of Grumpus finally dropped. Total = 72. *Edit - Right after I wrote this a second dropped with my remaining 8 boxes. So, 2 Minion of Grumpus / 80 Savage gifts. Farmed it this year with alts and got it at the 79th present. "Personne ne sait quand la légende de Grognus est apparue en Draenor, mais ses jouets sont vraiment horribles."